Need a guide for what to pray? This post will teach you the ACTS prayer method to use as an outline for your prayers. Learn to pray as Jesus taught with this simple prayer template. 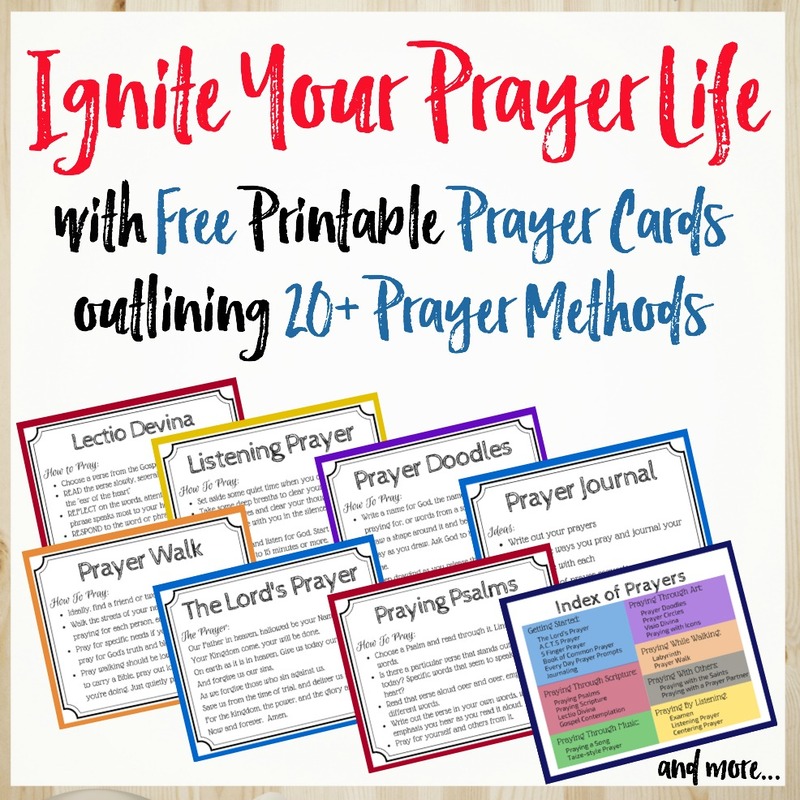 Don’t miss the free printable prayer cards for ACTS prayer and more! Why Do We Need an Outline for Prayer? As I read Matthew 6, Jesus’ teaching on how to pray, I sometimes feel the same way. While the words sound powerful, I struggle to translate them into my own daily prayers. The Lord’s Prayer is an easy prayer to recite, yet how do I learn from it to pray on my own? Wouldn’t it be great to have an outline for prayer, so I wouldn’t have to start with a blank sheet? Some days I sit down to pray and I just don’t have the words. Other times, I find myself stuck on one topic in my prayers for weeks, as if I’ve forgotten all the other topics I could include. To be honest, sometimes there are topics I just don’t like to cover, like confession. The ACTS prayer model uses the acronym A.C.T.S. to help you remember four key topics for your own prayers. It closely models the topics outlined in the Lord’s Prayer. This model provides that outline to help you find the words to pray and reminds you to cover these four key topics. Start your prayers with praise. Praise God for who he is. Worship him and acknowledge his greatness. This step is important not only to shower God with praise but to align your heart with his. Praise keeps your eyes fixed on God. Starting with a heart full of worship reminds you just who you’re praying to and what great power he has to answer your prayers. Tell God you’re sorry for where you’ve fallen short, where your actions haven’t lived up to God’s expectations, where haven’t done something you should have. Then, ask God’s forgiveness and help to do better next time. Don’t skip this one! Don’t fool yourself into thinking you don’t have anything to confess. You’re human – and so you sin, daily. Consider what you’ve done and what left undone. God’s ready to forgive you and shower you with his grace and mercy, but you first have to confess and ask for forgiveness. Tell God “thank you” for his work in your life. Give thanks for all the blessings of this life. This one is crucial, too. I’ll admit I’ve had seasons in my life where I struggled to see the blessings. The trials that surrounded me overshadowed all the blessings and I was so caught up in the struggle that I wasn’t looking for the good. Being intentional about praying for thanksgivings made me aware of just how many blessings I did have – even in the midst of my trials. Make sure to keep your eyes open for all the blessings God has given you. If you aren’t seeing them, start small – thank God for the sunrise, for a pretty flower you see, for the food on your table. As you begin to look for blessings, you’ll be amazed at just how many you’ll find. Ask God for your specific requests for yourself and other. Share what’s on your heart and where you need God’s help, guidance, and healing. Pray about the needs others have shared with you and come along beside them in prayer. This is the time to lay it all with God and fully open your heart. Let’s try it out together. Will you pray along with me? Add your own specifics in each section as we go. You, who are all-powerful, all-knowing, ever-present. I praise your wonderful creation. Lord, I’m sorry for all the ways I let you down and don’t live up to your expectations. Please forgive me for my actions this week – I messed up and I’m sorry. I’ll try to do better next time. Lord, I give thanks for how you’re in my life, leading and guiding me, loving me and showering me with your mercy and grace. Thank you for so many blessings in my life. Lord, I ask today for your guidance and healing – for me and for those on my prayer list. I submit to your loving rule over my life. Lead me and guide me. May I only follow where you lead. All this I pray through your Son Jesus Christ. Amen. How can you use the ACTS method of prayer to frame your prayers and pray the way Jesus taught? Maybe this simple acronym will be your ‘aha’ moment on prayer, reminding you of the basic components our prayers will include – even if you don’t include all four every time you pray. I love this video from The Skit Guys on Prayer. Watch their breakdown of The Lord’s Prayer at the end. PRAY DEEP CHALLENGE: Pray your own prayer with the ACTS prayer model today. Did you struggle with any of the parts? Focus your next prayers in that area. Want a free printable to help you remember the ACTS method of prayer? Join our Prayer & Possibilities newsletter for weekly prayer and spiritual encouragement and I’ll send you this printable prayer card for using the ACTS Prayer Method, along with 20 other prayer methods. If you want to experience the fullness of the Lord’s Prayer, you need to pray through it slowly, line-by-line. Learn to personalize the words and use the prayer as your framework for prayer. The study guide includes an introduction to each line of the Lord’s Prayer to bring greater focus to each week’s prayers. In addition to the prayers prompts included in the calendar, the study guide provides a brief daily devotional, additional scriptures, and key reflection questions to dig deeper. You’ll also get weekly recap worksheets to solidify what you’re learning about prayer and capture what God whispers into your heart as you pray. Available as a printable download or as a printed book. Click here to learn more about Pray Deep: The Lord’s Prayer. Already on our list? Enter your info below so I know to send you the download. Use the prayer calendar on its own or go deeper with the Pray Deep: The Lord’s Prayer study guide. This study guide expands upon the prayer prompts in the calendar to enhance your 40 day experience with the Lord’s Prayer.